They may not have taken the win on Saturday, but North Crawley sent an ominous message to the rest of Four Counties Division 1 on opening day. Taking on Milton Keynes, the reigning champions looked at their best with the bat in hand, posting a huge 354-2. Cranfield Uni celebrate taking a wicket against Newport Pagnell. Lewis Perrin and Glenn Young were the men out, both scoring 19, but it was the form of last season’s leading run scorer Alex Walker and batting partner Marcus Goss that will set tongues wagging. Walker ended on an unbeaten 189, with Goss similarly not out, scoring 103 as Crawley set the total for MK to chase. But Crawley’s opponents had something to say about it, and weren’t going down without a fight. Despite losing opener Imraz Siddiq without troubling the scorers, Javediqbal Naeem and Syed Hashmi set about rescuing things for MK. Naeen eventually went for 51, but Hashmi reached triple figures before falling on 100. But despite a flurry of late wickets leaving MK seven down, overs simply ran out for Crawley as the visitors ended on 200-7, and they had to settle for a winning draw. New City’s campaign got off to a losing start though as they were beaten by Thurleigh by five wickets. After a shaky start, New City recovered to post 171-9, with opener Dhruv Pankhania top scoring with 33. And despite losing opener Alastair Bailey for 1, Thurleigh always looked in control. Dropping five wickets, the home side scored 174-5 to win. 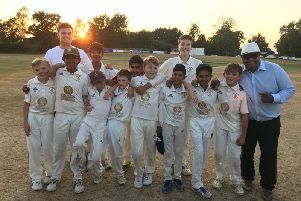 A superb spell of bowling between Ravi Ravi and Prashanth Ramji of Division 2 side Cranfield University bowled excellent spells to restrict Newport Pagnell to just 46 all out. Ramji took a sensational 4-6 while Ravi added 3-18 as Newport crumbled with the bat. They looked better with the ball though, but despite taking six wickets, the total was too low to defend as Cranfield (48-6) took the win. North Crawley 2nds were bowled out for just 99 against Eggington Foresters, despite restricting the home side to 149, while Olney Town (241-3) were 100 run winners over Old Bradwell (141). In Division 3, a great partnership between Vijay Baburaj (63) and Razzan Mohamed (67) helped Printers (264-6) to a 61-run win over Open University. Shenley Church End (101) lost to Ivinghoe & Pitstone (103-3) by seven wickets while Westcroft (134-9) lost to Luton Caribbean (170). In Division 4, MK 2nds (176-6) beat Milton Bryan 2nds (175-9), Westcroft 2nds (248-5) were 83-run winners over Eggington Foresters 2nds (165), but New City 2nds (111) lost to Wilden (112-7) by three wickets. Newport Pagnell 2nds (167-9) beat Thurleigh 2nds (148) in Division 6, and Old Bradwell 2nds (160) beat Stoke Hammond 2nds (134) by 26 runs. In Division 7, New City 3rds (74) were well beaten by Leighton Buzzard 3rds (272-6).